Last month’s explosion of social unrest in Brazil provoked a rich debate over the state of the region’s economies and societies. The fundamental question at hand is whether Latin America’s economic performance since 2003 is as strong as it once appeared. Did the past decade mark a decisive step towards inclusive, sustainable growth – or just the latest in a long series of booms that inevitably go bust? Two recent publications provide important context for this discussion. 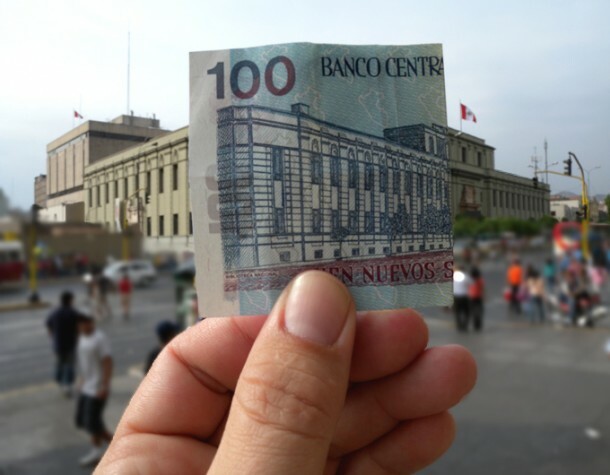 Economic Mobility and the Rise of Latin America’s Middle Class, published earlier this year by the World Bank, meticulously accounts for what actually happened to the Latin American middle class since 2003. In that year, the number of middle class Latin Americans was a little over 100 million; by 2010, it stood at 152 million – or 30 percent of the region’s population. 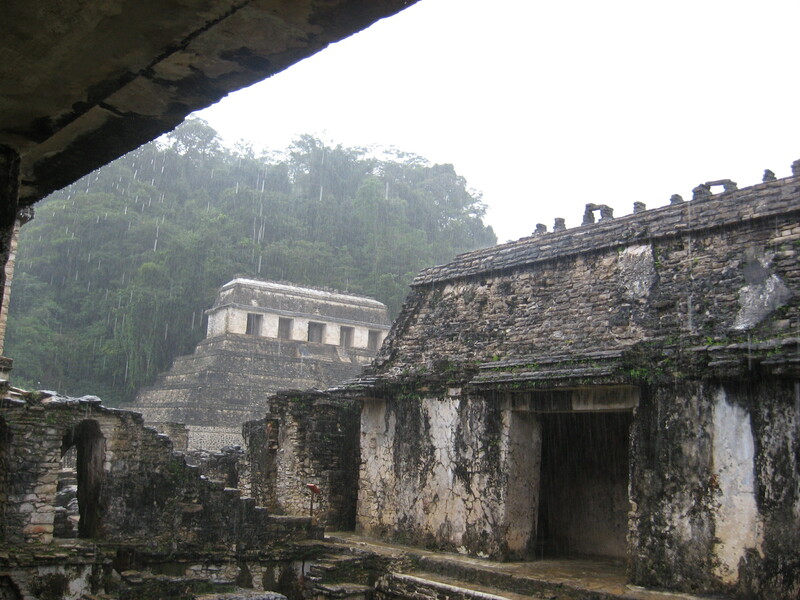 Over the same time period, the region-wide poverty rate fell from 44 to 30 percent. The year 2010 marked the first time in the region’s history that the number of middle class individuals matched the number of poor. But who qualifies as middle class? A massive literature in economics, political science, and sociology has grappled with this question, and competing definitions abound. The World Bank researchers base their calculation of the middle class on the notion of economic security – a household in the middle class should have a suitably low chance of falling back in to poverty. In this case, they settle on a 10 percent likelihood of falling into poverty over a five-year period as the cut off. This approach seems reasonable. It captures the notion that the middle class should not only have attained a given level of income but also enjoy a qualitatively different lifestyle than the poor. They should be doing better than just scrapping by and should not have to worry about day-to-day survival. They should have the disposable income, and also the time and mental energy for leisure pursuits (and also, the thinking goes, to protest in the streets). The authors estimate a per capita income of US$10 a day as the cutoff for the middle class. The poor, by contrast, have income of less than US$4 a day per capita, based on a standard measurement. This classification creates a category of individuals who have escaped poverty but have not attained the level of economic security that would qualify them as middle class. This group, with incomes between US$4 and US$10 dollars a day, are identified as “vulnerable” – and their numbers are huge. The vulnerable group grew apace with the middle class over the past decade. They represented 38 percent of the region’s population by 2010 – more than the poor or the middle class. Highlighting this group of in-betweeners – people whose raw income level puts them technically out of poverty but who run a considerable risk of falling back into poverty – is critical. Because of the vicissitudes of measuring the middle class, the large swath of “vulnerables” is often lumped in to the middle class along with genuinely well-off families on the upper end of the middle class bracket. This makes little sense, which is why it is also wrong to equate the recent protests with the latte-sipping, iPhone touting bourgeois of popular imagination. 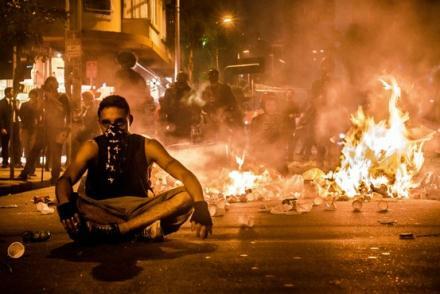 Plenty of the “middle class protestors” who took to the streets in Brazil and Chile are likely in a precarious state and risk falling back in to poverty. This risk is especially acute considering that the period of strong growth driving the 2003-2010 middle class surge is most likely a thing of the past. This is the key takeaway of the Brookings Institute’s recent macroeconomic overview, suggestively titled “Are the golden years for Latin America over?”. Their answer is yes. This is not a new sentiment, but the analysis behind their conclusion is telling. The Brookings authors point out that two key external determinants of regional growth – commodity prices and bond yields – have actually been more favorable during the 2011-2012 period than they were in the “golden years.” But rising commodity prices and falling bond yields only provide a one-time boost to the region; they cannot help sustain growth levels. Just the latest boom that inevitably goes bust? What is holding economies back? The authors cite domestic supply bottlenecks such as low human capital, poor infrastructure, and a resulting stagnant productivity. This will sound familiar to anyone who has read a report on Latin America’s economy over the past decade. It is, of course, undeniable that countries from the Rio Grande to Tierra del Fuego need to improve infrastructure and education. The millions of protestors pouring into the streets last month were only the latest reminder of these long-standing deficits. But investments in these areas are medium term propositions. In the near term, governments in the region will have to address a critical mass of vulnerable, lower-middle class citizens whose dividends from the so-called golden years may or may not have included formal employment, rising wages, and social security benefits. And they will do so in context of first-world rather than Chinese growth rates. This scenario puts a premium on well-targeted social policies. 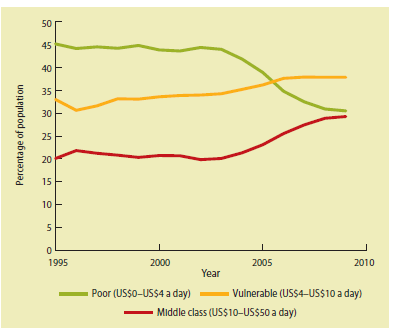 In many countries, however, social protections favor the middle class at the expense of the poor and vulnerable. In Mexico, for example, the government itself estimates that 84% of social protection spending goes to workers in the formal sector –which represents only 40% of the total labor force and, of course, comprises those workers who are already doing relatively well. 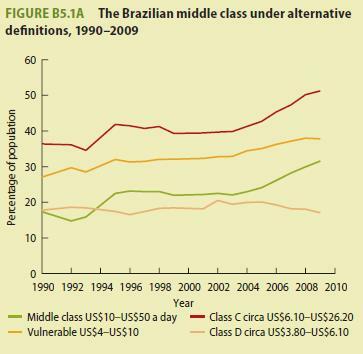 Brazil’s main cash transfer programs spend more on the middle class than the vulnerable and the poor according to the World Bank’s analysis. The situation is similar in much of the region. So while governments by all means need to make the medium and long term investments in human and physical capital to remove structural barriers to growth, they also need to act in the near term to ensure that slower growth does not erode the tenuous social gains of the past decade. The verdict on Latin America’s “golden years” is still out. This entry was posted in Andean Region, Brazil, Mexico + Central America, Southern Cone, Uncategorized and tagged Latin American golden years, Latin American growth, Latin American middle class, the Rise of Latin America’s Middle Class. Bookmark the permalink. 4 Responses to After the ‘Golden Years,’ what next for Latin America?